It's always nice when the guys behind the scenes get some recognition - that's why we dig figures like Steve the Victim, which are based on the people who make the toys we love. 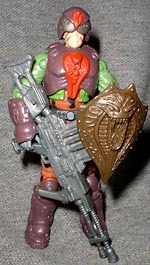 The ultimate example of this sort of honor is probably that of the 1980's GIJoe line and its introduction of Tunnel Rat. Crawling through the cramped, dark tunnels and narrow ductwork beneath Cobra Headquarters is a dangerous job. Patrolled by the Cobra B.A.T.s, the catacombs are a bad place to be caught alone. For this reason, Tunnel Rat has put on his SpyTroops disguise. Resembling a Toxo-Viper, one of the troopers responsible for cleaning up the nasty stuff that seeps into the Cobra sewer system, Tunnel Rat can slip past without raising suspicion. However, the documents are being guarded by Over Kill, the half-human, half-android leader of the Cobra B.A.T.s. With his enhanced sensors, will Over Kill detect the disguise before Tunnel Rat can escape? The idea of the SpyTroops line is a simple one: Cobra and GIJoe both have operatives trying to infiltrate the other organization. In the world of GIJoe, this does not involve trying to recruit the other's agents, but rather putting large pieces of armor over your usual garish costume. Military intelligence. The majority of the GIJoe figures are sold in two-packs: one hero, one villain, and a nice selection of weapons. Everybody comes with a built-in enemy to fight, and you're more likely to pick up figures that you otherwise would have avoided like the plague. Plus, everyone remembers how, as a kid, you always seemed to end up with more of one side than the other, leaving three Joes surrounded at all times by Cobra forces - making the toys adhere to the buddy system helps solve that problem. A tough kid from the mean streets of Brooklyn, Tunnel Rat got even tougher going through the Ranger course at Fort Benning and on numerous top-secret missions. He has a special love for demolitions. He earned his code name by crawling into enemy tunnels with a cocked .45 in one hand, a trench knife in the other, and a flashlight clenched in his teeth. Duke thought that Tunnel Rat was the perfect GIJoe to infiltrate Cobra underground systems since "he was already poking around down there anyway." Tunnel Rat was really one of the better Joe figures in the original line. His costume looked more like an actual uniform than what most of the figures had, and he brought a subtler brand of ethnicity to the team than Quick Kick, the Asian Martial Artist, or Stalker, the Angry Black Man. Tunnel Rat's uniform has been updated slightly, but nothing major - it does need to fit under the SpyTroops armor, after all. Everything's there that we got before, from facepaint to do-rag to the bandana around his neck. To disguise himself as a Toxo-Viper, Tunnel Rat has boots, gloves, chest armor, a helmet, a shield and the biggest darn gun you've ever seen. The reddish armor fits in place well, and actually does a fairly decent job of disguising his identity. The two pistols on his belt are non-removable, but they do look quite nice. Being the leader of an entire unit of android troopers comes quite naturally to Over Kill since more than fifty percent of his body has been replaced by mechanical parts. He is also equipped with integral body armor, a self-contained breathing unit and a wireless modem implanted in his brain. Having command of a small army of mindless robots has affected his mind, making him overly sentimental and protective of his "troops." Over Kill sees them as individuals and gives them secret names, picking out some for special attention. In the original line, Over Kill was a full android, not a cyborg. Cobra science has obviously advanced over the years, since they've apparently added human parts to what was formerly a machine. And yet these guys lose all the time? What the heck? Over Kill is much more intimidating now that he used to be - primarily because he's swapped out the neon green and gold for black and blue armor. He's got a red scarf around the lower half of his face, and a helmet that fits snuggly on his head (probably to hide his resemblance to Annie Lennox). One of two weapons can be plugged into Over Kill's right arm: a tremendous gun or a big serrated blade. So, why was Tunnel Rat an example of honoring the men behind the scenes? Well, ask any GIJoe fanatic and they'll tell you that the one man most responsible for creating the line and its world was writer Larry Hama. When Hasbro saw the success of the Star Wars line, they realized that a their long-dormant GIJoe line could be reborn with a story and characterization that would appeal to young kids. They contacted Marvel Comics for help, who handed the assignment to Larry Hama. Hama had recently pitched a series - called "Fury Force" - about a daring, highly trained special mission force. 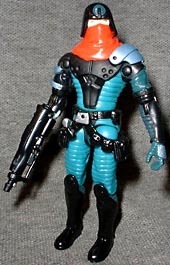 Hama quickly switched gears, turning his concept into a backstory for GIJoe. Hama wrote nearly every file card bio for the figures over the years, and continued to direct their stories in the Marvel comicbook. He is personally responsible for turning a line of generic soldier toys into a marketing juggernaut that continues to roll strong today. In 1987, Hasbro released Tunnel Rat, an Explosive Ordinance Disposal specialist. The figure's likeness (though not his bio) was based on Larry Hama, putting the creator into the hands of fans. The new Tunnel Rat is still based on Hama, and new sculpting and molding techniques have produced a better likeness than ever. So it's supposed to be "weird" that Over Kill assigns personalities to the B.A.T.s? Why? Tell us on our message board, The Loafing Lounge.